Today, Bluetooth is everywhere, from mobile phones, computers, speakers, lamps to wearable gadgets, like smart watches, earphones and fitness bands. Scientists, at the University of California, San Diego, have developed an entirely new wireless communication technology that, given its many advantages, seems to be a better and more sophisticated alternative to Bluetooth. The prototype, designed by the team, uses magnetic signals, sent through the human body, to wirelessly transmit data between two wearable electronic devices. The research, recently presented at the 37th Annual International Conference of the IEEE Engineering in Medicine and Biology Society in Italy, discusses a new, and more efficient, wireless data transmission technique, known as “magnetic field human body communication”. Here the body acts as the central vehicle for conveying magnetic energy between a pair of electronic devices. According to the team, one way of reducing power consumption while transferring data, with the help of wearable wireless systems, is to ensure that the signals can travel freely from one part of our body to the other. In the future, people are going to be wearing more electronics, such as smart watches, fitness trackers and health monitors. All of these devices will need to communicate information with each other. Currently, these devices transmit information using Bluetooth radios, which use a lot of power to communicate. We’re trying to find new ways to communicate information around the human body that use much less power. This technique, to our knowledge, achieves the lowest path losses out of any wireless human body communication system that’s been demonstrated so far. 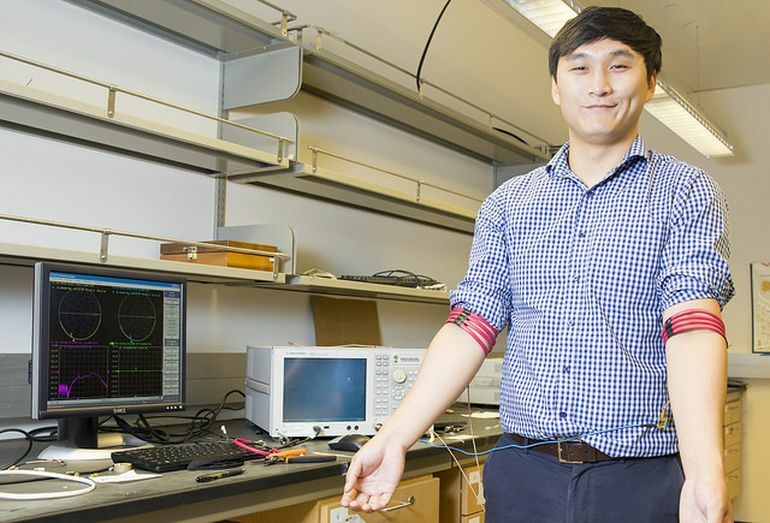 This technique will allow us to build much lower power wearable devices. Increased privacy is desirable when you’re using your wearable devices to transmit information about your health.